Before joining the Gardner Museum in 2005, Amore logged 15 years of national security, law, intelligence and crisis management experience with two federal government agencies: the U.S. Department of Homeland Security’s Transportation Security Administration (TSA), where he helped rebuild security at Logan International Airport after the attacks of 9/11, and the Federal Aviation Administration, where Amore, a Special Agent, led the response to the notorious Shoe Bomb attack. Amore has earned a Master of Public Administration and a Certificate of Mastery in National Security from the Kennedy School of Government at Harvard University. He offers his expertise on security and cultural property protection as a columnist for the Huffington Post and was also a columnist for the Boston Herald, writing on transportation security matters. 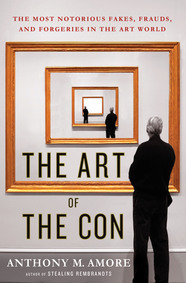 Anthony M. Amore's The Art of the Con tells the stories of some of history's most notorious yet untold cons. 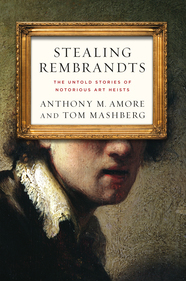 Stealing Rembrandts is an exhilarating, one-of-a-kind look at the black market of art theft, and how it compromises some of the greatest treasures the world has ever known. Stealing Rembrandts: The True Story of International Art Theft Art theft is a multi-billion dollar per year illicit industry, and the world’s most significant heists share one thing in common: the priceless works of Rembrandt. The great Dutch Master’s paintings are known for their value by everyone, from high school dropouts to museum curators. While Hollywood has portrayed the theft of high-value paintings as the work of dashing, likeable thieves working to steal art for evil, reclusive geniuses, in fact that’s nothing like the reality of art theft. Instead, it’s much more interesting. Amore takes his audience behind the scenes of the most notorious of these heists, telling the true story of art crime from the conception of the crime to the recovery of the art. The Art of the Con: Notorious Fakes, Frauds, and Forgeries The famed former director of the Metropolitan Museum, Thomas Hoving, famously said that 40% of the art hanging on the walls of the museums and galleries of the world are fakes. Art forgery scandals continue to dominate the pages of the industry’s newspapers and, in recent years, have led to the closing of some of the world’s oldest and most esteemed galleries. Though talented copyists are involved in the most famous scandals, Amore describes how the true art in art scams is not on the canvas but in the con itself. "Thank you for Sunday's wonderful presentation. We received tremendous positive comments. You now have a few more people on the lookout for lost masterpieces." "Thank you for the introduction to Anthony. He was our speaker last night at The Bohemians and absolutely killed it; everyone was thrilled and enjoyed the evening. His presentation was perfect." "[The] Road Scholars enjoyed your lecture and said, 'It was worth the wait.'" "Thank you so much for a marvelous presentation last night. I have been hearing rave reviews this morning. I hope you will be willing to come back when your new book comes out." "Your visit and presentation on Wednesday was an overwhelming success! The feedback I received all day yesterday was so positive and those who shared their thoughts with me expressed their gratitude for the opportunity to hear you speak, for the time you took to personally talk with everyone and sign copies of your book, and complimented your knowledge, poise, and candor." "Thank you for outstanding presentation at the recent InfraGard meeting. I had numerous positive comments from the members commenting how much they learned." "Just a quick note to say thank you so much for a wonderful evening. People were raving and said you were the best of all! You are a great story teller and have a great wit and a lovely way with people. It seemed you were happy to be there and were very engaging. The subject is fascinating and I, for one, learned a lot!"